In my quest for Japanese language proficiency, I have become stuck on many vocabulary. The latest is 下げる (sageru) and 下がる (sagaru). I know one means “to get lower” and the other means “to lower”, but I have had the most difficult time differentiating the two. They’re just too similar, and I often get the two backwards. I thought I might blog about it to help form a deeper memory of the two, and hopefully reinforce which means what. I had a similar struggle with 午 (go) vs. 牛 (ushi). The first means noon, the second means cow. Very similar looking, but entirely different meanings! The thing that helped me memorize the difference between 午 and 牛 was a picture I found on a message board that compared the two. Cows have horns on top! That is the reason for the little extra bit on top of 牛 (ushi) which 午 (go) lacks! 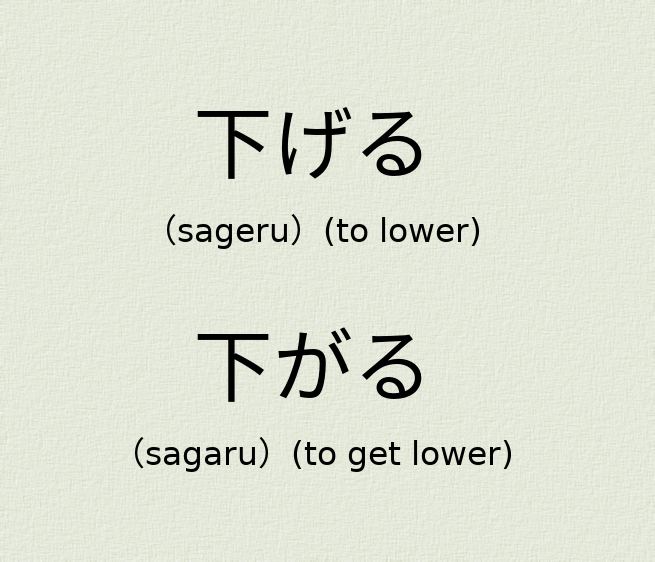 The difference between 下げる (ｓａｇｅｒｕ) (to lower) and 下がる (ｓａｇａｒｕ) (to get lower). How can I tell the difference between these two? How can I remember? I searched the internet for the difference between these and wasn’t able to find anything like with 午 vs. 牛. Sorry to tease you with the idea of an answer. My point in sharing this is that my mnemonics are a sure way to remember my knowledge. Even if I shared mine with you, it probably wouldn’t have the same effect on your memory. If you need to remember something, form your own mnemonic. The better it evokes your feelings, the better mnemonic it will be!